Forty years worth of poems from nineteen collections, with a generous addition of new pieces, this collection contains the themes and treatments that have moved Glenna Luschei all her life: sympathetic understanding, wry judgment, the experience of sensation and of loss, the act of witness, the love of nature and its processes, and longing for peace and harmony in a world often dominated by injustice and the abuse of power. Poet, editor, small press pioneer, and devoted friend of literature, Glenna Luschei tells the truth and never denies her own voice. You make me cry. You do all this for love. you dare to dream. Someone has to act. 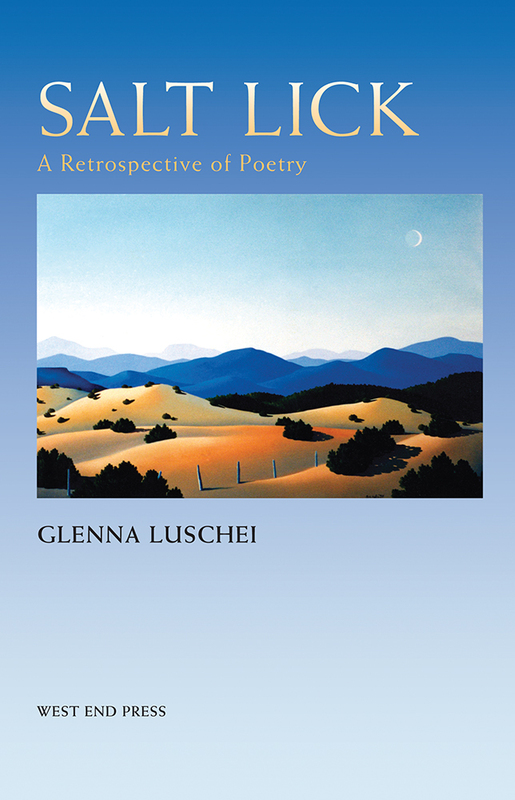 over the rainbow. . . .
Glenna Luschei grew up in Iowa and moved to Albuquerque, New Mexico, where she started the poetry journal, Café Solo, in 1967. After she moved to California, she began publishing under the Solo Press imprint. She has served as chair of the Committee of Small Magazine Editors and Publishers and won a National Endowment for the Arts Fellowship as well as a D. H. Lawrence Fellowship in New Mexico. She lives in Carpinteria, California.